As marketers, we often find ourselves on the dreaded execution treadmill. Running from campaign to campaign and tactic to tactic without understanding the impact we’re having on the bottom line. A high-performance marketing plan can help you understand how your programs are doing, tie them back to revenue, and show you where you should be prioritizing your time. 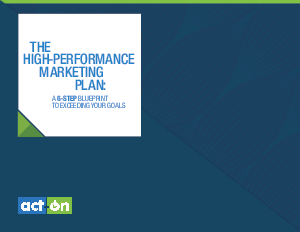 Get started on your plan today with this six-step blueprint for developing a high-performance marketing plan.